With the recent eBay changes adding the store inventory into the core search, it is much more important to understand your competition. Remaining (or becoming) competitive is truly the only way to achieve success when selling commodity items. For one-of-a-kind items, auctions still remain the best bet, but for commodity items, you’ll need to stand out from the crowd. 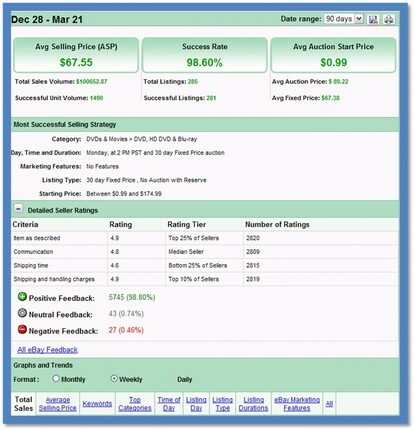 Vendio eBay Market Research provides competitive data on a seller or product level and it’s a great place to start when developing your competitive strategy. On a product level (researching by product), you’ll be able to view at a glance all the pricing data and recommendations for listing successfully. In addition, you can view keywords that should be used to drive a products success (what terms are buyers using to FIND the product) and on a competitive level, you’ll be able to see the top sellers by product and view the details on what makes them successful. This will give you great insight. Find out when and how they are listing their items and at what price. Do they charge shipping or offer free shipping? Use the information to create a listing strategy that really works for your product. In addition to product research, you can type in your competitor’s eBay user ID to get the same great information on a seller level (vs. a product level). You can view their overall strategy and see what’s really driving their success. I can’t show all the graphs that are available (or this blog post would be loaded with Images). However, you can see from the image that you can view the graphs and trends for many different areas (average selling price, keywords, time of day, categories, etc.). While Research gives you the “numbers and data”, it does not account for the other reasons a seller may or may not be successful, such as customer service, attractiveness of the listing and policies. Use Research to actually look at the successful listings and determine how you can improve on what you see. Can you make your policies friendlier? Can you make your ads more readable? Can you make your ads more attractive. Go into your competitors ads with a “red pencil” and then do the same for you own ads. There is always room for improvement and better methods to convert browsers to bidders and buyers; it just takes a bit more work than it used to. And one final recommendation, if you go through the process of researching and understanding your competition – don’t stop there. Make it a part of your normal weekly, bi-weekly or monthly process. Doing it once is great, doing it regularly ensures that you can always stay ahead of the “next” curve. This entry was posted on Monday, April 5th, 2010 at 9:46 am	and is filed under eBay Marketplace. You can follow any responses to this entry through the RSS 2.0 feed. Both comments and pings are currently closed.